The fatal shooting of Scott by Michael Slager in April 2015 set off national protests over racially biased policing. The son of a black man gunned down by a white South Carolina police officer made an emotional plea for justice as the sentencing phase of the trial continues. Michael Slager shot Scott to death while he was running away from the officer in North Charleston on April 4, 2015. The state of South Carolina, as part of the plea deal, will not file new charges against the former patrolman. A judge declared a mistrial Monday afternoon in the fatal shooting of an unarmed black man at the hands of a South Carolina former patrolman. The indication that up to 11 jurors were close to convicting Slager — on some kind of charge — suggests prosecutors were close to succeeding the first time. Michael Slager is charged in the April 2015 shooting death of Walter Scott, who fled from a traffic stop and resisted arrest. The final moments of their encounter were captured on a bystander's cellphone video that shocked the nation. 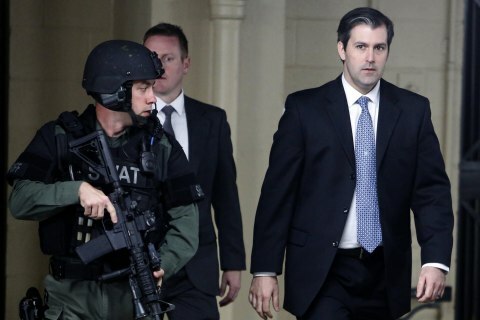 South Carolina Judge Clifton Newman on Tuesday granted jurors the right to visit the crime scene where Walter Scott was fatally shot by former police officer Michael Slager. "My family’s been destroyed by this. Scott’s family has been destroyed by this," Slager told the defense, getting emotional. A state investigator acknowledged that it was the defense team that found additional "projectiles" at the scene of Walter L. Scott's fatal shooting. 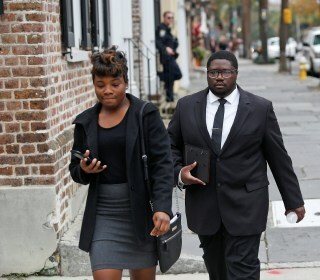 Scott's wounds "seemed to be in the back and side and didn't seem to be correct," the investigator testified during the trial of Michael Slager. Ex-cop Michael Slager's attorneys contended in opening statements Thursday that Walter Scott tried to wrestle away a Taser from him. But prosecutors argued that didn't justify shooting Scott in the back. A jury of six white men, five white women and one black man will hear the case of Michael Slager, charged with murder in the April 2015 shooting death of 50-year-old Walter Scott as he fled a traffic stop in North Charleston. Jury selection in the murder trial of Michael Slager was scheduled to begin Monday in Charleston. The North Charleston, South Carolina, officer was granted $500,000 bond after a judge suggested it was taking too long to bring him to trial. The settlement avoids a civil suit, but a former police officer still faces murder charges in the shooting death of the unarmed black man in April. The ex-South Carolina police officer accused of fatally shooting an unarmed man running away from him was denied bond on Monday. A judge said he needs more time to decide whether the ex-South Carolina cop who killed Walter Scott after he turned and ran should be granted bond. Slager’s attorney says he made a quick decision to shoot because he believed Scott might pull a gun and shoot him first. 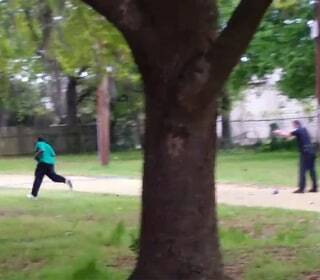 The officer shot and killed Walter Scott, who was unarmed, on April 4. The police officer charged with murder for shooting Walter Scott to death will probably not face the death penalty if convicted, a prosecutor said. The man in the car with Walter Scott before a South Carolina cop killed him says he doesn't know why Scott ran, "but I know he didn't deserve to die." Officer Michael Slager also made a nervous laugh in conversation with another officer after the April 4 shooting. Mourners were gathering Saturday morning to remember Walter Scott, the black man shot to death by a police officer last weekend in South Carolina. The South Carolina Law Enforcement Division said investigators thought things didn't add up after a cop fatally shot a man in the back. Police have released dash cam video from the patrol car of Officer Michael Slager, who is now charged with the murder of Walter Slager. "I pray for them, just like I pray for us." Karen Sharpe said of Walter Scott's family. She says she has not been able to watch the infamous video. Take a frame by frame look at the video showing the death of Walter Scott at the hands of Officer Michael Slager. Does it match Slager's incident report and what is the unidentified object he leaves near Scott's body? Mario Givens says that the same officer who shot to death Walter Scott shot him with a Taser gun in a 2013 case of mistaken identity and police abuse. The official response in North Charleston is very different from the most recent high-profile shooting -- in Ferguson, Missouri. How the police account differs from the video and a witness account. Walter Scott, the man whose fatal shooting by a police officer shocked America, was a father of four remembered as kind, outgoing, and passionate. Scott, 50, was killed following a routine traffic stop in an incident caught on cell phone video by a witness. Officer Michael Slager was charged with murder after cellphone video emerged showing him fatally shooting 50-year-old Walter Scott in the back. The officer who killed Scott, 50, was arrested for murder — a rare criminal charge for such police-involved deaths. OpEd: Are We All Just One Bullet Away From Becoming a Hashtag? After what should have been a routine traffic stop, another black body lay lifeless in the street. Dozens gathered Wednesday to call for better policing after a North Charleston officer was arrested Tuesday in the fatal shooting of Scott. Michael Slager, 33, was arrested by the South Carolina Law Enforcement Division in the shooting death of 50-year-old Walter Scott. Walter Scott's parents say "justice will be served" following the release of video which shows cop Michael Slager fatally shooting their son. The shooting of black father Walter Scott follows several other high-profile cases of cops opening fire on civilians in South Carolina. A white police officer who shot a 68-year-old black man to death last year in his South Carolina driveway was charged Tuesday with a felony.